Skills and Abilities: Thanks to his pod feeding him information for most of his life he is a keen scientific mind. Powers: Under a yellow sun he has superhuman speed, strength, endurance, resistance to injury, microscopic vision, Heat vision, Enhanced senses etc. like Superman. 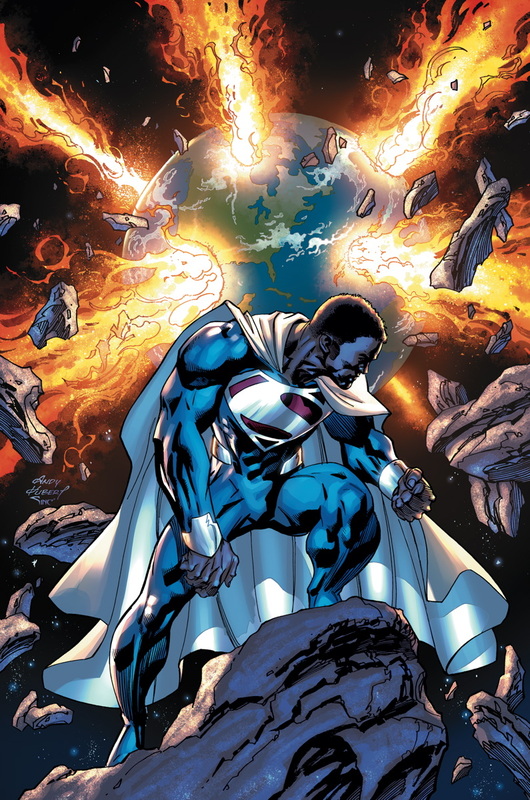 His strength is comparable to other black supermen such as Icon, Blue Marvel, Harvey Dent and president superman. Weakness: Green Kryptonite cause him pain and weakens him. On the alternate world of Earth 2 the Zod family came from Vathlo island where dark-skinned Kryptonians had lived for years, the same place President Superman originated. Val was an only child but when his parents tried to “speak the truth to power” they were punished for it and put to death. Lara and Jor-El then took him in and treated him as though he was his their own child. He became fast friends with fellow orphan Kara-Zor-El. When Krypton was on the brink of destruction Lara and Jor-El launched four Kryptonian ships which managed to escape the planet [Earth 2 #25]. One contained Kal-El who would become Superman, another contained Kara-Zor El who would become Power Girl and one of them contained Val-Zod. Inside his pod his mind was fed the teaching of his parents, scientists about peace and the need to avoid war and conflict at all costs. Stuck in the Capsule most of his life he became afraid of anything beyond his “bubble” [Earth 2 #22]. His pod crash landed on Earth and he was found by Terry Sloan had secreted him under his base. He was attended to by Kym and secured behind a vault door. He was told he could leave at any time though he opted not to for his own protection. Upon meeting Batman, Jimmy Olsen, Aquawoman and Red Tornado he becomes ill. At that point Batman who is carrying Kryptonite realizes that the boy is Kryptonian. He is carried away by Red Tornado and Batman saved by Hawkgirl while evil superman rages war on the United States [Earth 2 #19, 2014]. 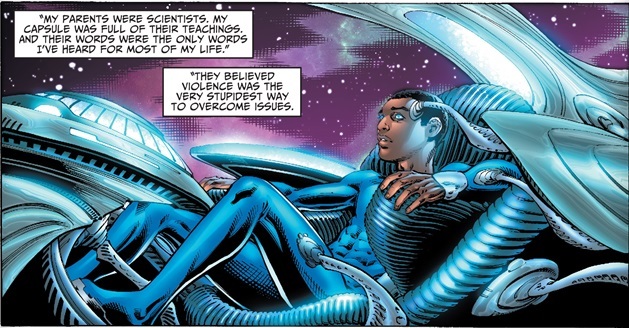 Once at their secret location they try to convince the boy to embrace his powers and try to help them save the planet [Earth 2 #20]. After agreeing that needed to help his new-found friends he was trained in to fly by Louis Lane, now Red Tornado and Hawkgirl. The training didn’t last long however as the evil original Superman now under the control of Apokalips descend on the trio with para-demons and tried to kill them [Earth 2 #22]. His unwillingness to fight during the battle lead to the death of Red Arrow, the capture of Red Tornado/Louis Lane and the heroes needing to flee. On Amazonia he revealed the House of El symbol o his chest [Earth 2 #24]. With the aid of Dr. Fate he rises up against the evil Superman but not before the opening of a Boom-Tube. In the process Evil Superman is destroyed after being revealed as a clone of the original [Earth 2 #26]. While investigating a fire pit in Geneva alongside Thomas Wayne/Batman and Red Tornado/Louis Lane they are attacked by the Fury of War [Earth 2: World’s End #1-3]. After their defeat he combines his speed with Kara Zor-El/Power Girl to end a contagion threat and in the process the two realize as adults there feelings are more than just friendly [Earth 2 #27]. Val used the remaining lab equipment to build suits for Helena Wayne/Huntrees and Thomas so they could enter the fire pit. Inside they are confronted by Desaad who captures huntress and flees. They also stumble onto the cloning facility of Desaad and Val destroys Thomas’s power giving drug when it compromises his mind [Earth 2: World’s End #4-6] . Same here and my new favorite hero! So dis is wat DC retorts 2 doing as an effrt 2 actively disregrd ICON by mking yet anothr variant of Supaman 4 d 10,000th tym. Dey shd hv just used Icon instead which wud hv bn fresh, unik, diffrnt & WITH FAAAAR gr8r potential. … frm a differnt planet whose history is still vague providing plenty 4 devlpmnt. … affiliatd 2 sum sorta inter-planetary/inter-galactic alliance “d Cooperativ” along with their tek, alien civilians & its associatd political-action-drama which wud connect nicely with d GL mythos. … has an extnded history since d 1800’s providing plenty of mysterious intrigue 2 his history. … fascin8ing devlpmnt supprt xcters & teams frm Milestone. It clearly says in issue 20 that he is “One of four”. Not one of three as you claim. The fourth capsule might contain the Earth-2 Krypto (neither a bully breed nor a solid white “beagle” like his predecessors),Beppo,(a telepathic baby gorilla instead of the Kryptonian equivalent of a Capuchin monkey) and ??? (Perhaps,a future,benign Doomsday). Meh, if the give him or to do instead standing around gawking and following Powergirl, redesign his gear he be ok to me. Blue eyes – really? And I gotta agree, why just use Icon. He only show up in Static ONCE and that was it. ICON IS GOING BACK TO MILESTONE COMICS,SO VAL I GUESS WAS CREATED TO TAKE HIS PLACE. Oooh Ok. I just hope they give Val-Zod some shine and not relegate him to a 4th tier of importance.. I love Val, he’s the reason why I started to read Earth 2 again. I just hope he gets to do more.